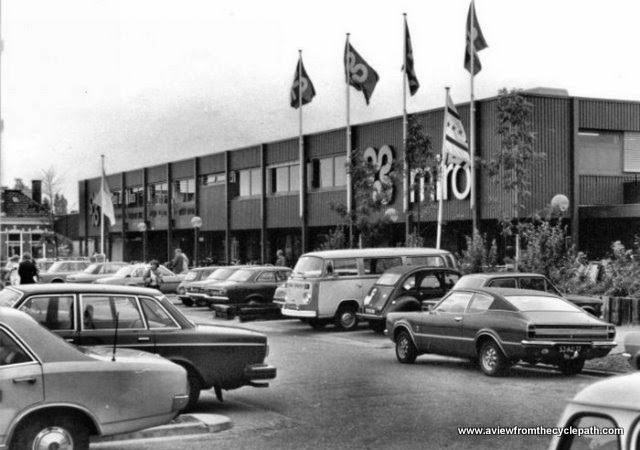 A supermarket in the centre of Assen in the 1970s. Note that the car-park is more than full. Conditions for cycling were not particularly pleasant at this time and it should be no surprise that cycling was in decline across the Netherlands when this photo was taken. It's not unusual to hear calls from cyclists, especially cycling campaigners, for an increase in the price of car parking. The belief is that increasing the cost of driving is essential to prevent other people from choosing to drive cars, and it's usually assumed that this will somehow make those other people then choose to cycle. I've always found this to be a strange belief, especially when it is expressed by people who can well afford to park a car but who prefer to cycle because they enjoy it. My personal choice to cycle has never really been about saving money. I cycle because of convenience and because I find cycling to be pleasant. I've always believed that if other people could find cycling to be as convenient, safe and pleasant as I find it then this would enable those other people to make the same choice as I do. No-one needs to be forced to do something that they want to do anyway. Sadly, few places in the world offer people a genuinely free choice to cycle. Outside the new supermarket on the same site as above with a study tour group last week. This shopping centre has cycle-paths at one end and other well designed infrastructure at the other end providing safe routes to both doors. Bicycles can be taken inside and parked right next to the shops. Car parking is free of charge for shoppers but cycling is the most popular way of visiting the supermarket. Cycling in most towns does not feel safe. That makes cycling not particularly pleasant for most people. What's more, routes shared with cars result in cycle journeys rarely being much quicker than driving. When people choose to drive under conditions hostile to cycling we need to recognize that a rational choice is being made given the options available. While conditions for cycling are unpleasant, people will continue to pay to park their cars almost regardless of how much it costs. They'll certainly complain more if it gets more expensive, but it will take extremely high prices to force people to stop driving and instead do something that they find to be dangerous and unpleasant, and this of course impacts harder on those whose wallets are less full. On the other hand, if we make conditions for cycling pleasant, people will choose to cycle even if parking is cheap or free of charge. We see this at many locations in Assen, as there are many locations here where free parking does not fill up. The supposed lure of free parking turns out not to be very strong at all when people actually have a more pleasant and convenient alternative. By creating attractive conditions for mass cycling, people from all walks of life now have a free choice. The population reacted by opting to cycle instead of driving this is more convenient. While car ownership is quite high, those cars are not used for every journey. More journeys are made by bike than by car in Assen. There's free car parking at many locations in Assen but though car parking is so often free of charge, those car parks remain relatively empty. Rather than trying to push people out of cars by charging high rates for parking, Assen demonstrates a more successful and less controversial way of encouraging people not to drive cars: a better alternative exists in the form of the bicycle. You can't find this free covered underground car park on Google Maps. It's under a different shopping centre, which we also visit on study tours. I've never seen it even close to full. Most visitors prefer to park their bikes above, right next to the shops. Like many places in Assen, the hospital offers free car parking. While both cycling and driving are easy, the cycle-routes to the hospital in Assen make cycling into a pleasant way of making this journey. This encourages people to cycle, whether patients, visitors or staff. People are more likely to drive to a hospital than many other locations because transporting someone who has discomfort due to illness or injury by bike may not be a good idea, but even in this location the car parking rarely, if ever, fills up. In this image from Google Maps, just as in real life, the car parks are not nearly full. Free parking is not really an attractor. It doesn't make people feel they have to drive when driving is otherwise less convenient than cycling. 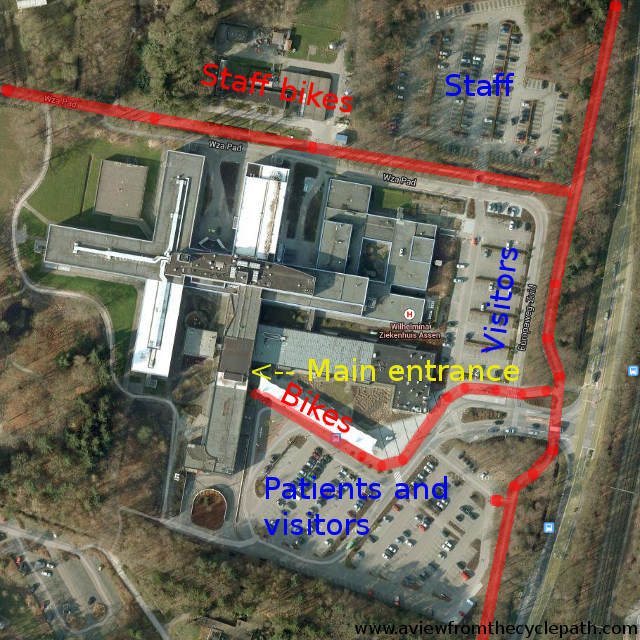 Cycle-paths are shown in red - leading right up to the hospital main entrance. causes no problem for everyone else. To grow cycling, it's necessary to convert non-cyclists into cyclists. When the majority of the population either already drive cars or see themselves as future drivers, there is nothing to be gained by antagonizing or alienating that majority. of Assen (300 m from the main square). parking demand. Capitalism in action. There may well be good reason for higher car parking charges in some cities, but that's not a discussion which cycling campaigners should be involved with. It is better that parking charges are decided on grounds other than that some members of a group representing a small minority perhaps do not like cars. Cycling issues overlap with but are not strictly environmental issues. Cycling campaigners campaigning against cars can foster an "us vs. them" mentality and make it more difficult for people who do not currently cycle to become cyclists. despite the attraction of free parking. What cyclists need most is better infrastructure. When there's a comprehensive grid of high quality cycle routes which goes everywhere, when distances on those cycle routes are shorter than distances by car, and when all three types of safety have been taken care of then this maximises the attractiveness of cycling. Dedicated cyclists will make the maximum number of journeys under such conditions. However, not only does this provide the best environment for existing cyclists to make efficient journeys but it also provides the best environment possible to encourage people who do not currently cycle that they would also benefit from doing so - a step which they are far more likely to make if they do not see cyclists as "other". It is better for cycle campaigners to spend their time on making conditions for cycling more attractive than on being concerned about the conditions for driving. The Netherlands demonstrates that this is more successful. A few weeks ago,the BBC reported on a woman in London who has no choice but to walk seven miles to her minimum wage job because she can't afford a car and public transport takes too large a chunk out of her small salary. Still not close to good enough, London. Proper Roundabout, anything but that. An increase in the price of car parking does nothing to stop people who already can't afford to drive from driving. It does nothing to help those who are also already priced out of public transport. Walking for so long each day cannot be convenient, but cycling is still not seen as an option. People in similar situations could be very well served by cycling but this will happen only if the conditions for riding a bike in become considerably more attractive than they are now. Sadly, London cycling conditions remain unattractive and there are still no plans to provide the city with what it really needs. Rich people have far more options than the less well off. Those on a limited income suffer a disproportionate discrimination through costs which are not proportional to income. If the current least bad option for someone is to drive a car (which is the case for some people) then making this more expensive can make life very difficult for that person. Simply increasing costs does not provide people with another better choice. Unlike increasing the cost of parking and also unlike the cost of public transport, making cycling more accessible is not regressive. Cycling infrastructure opens up a new option for everyone regardless of their wealth. Cycling is a great social leveller here in the Netherlands and it has the same potential in other countries. But this doesn't come without investment in proper cycling infrastructure. When good enough conditions exist for cycling, it moves from being a minority pursuit to something that everyone can and wants to do. Some people might still be forced to cycle for financial reasons, some might do so purely because it's good for their health and there are certainly quite a lot of people across the world including here in the Netherlands who cycle simply because they like cycling. However, for cycling to become attractive and useful for the majority of people, the reasons to cycle must be those of convenience, pleasantness and relative safety. Why can't all children everywhere live like Dutch children ? It is at that point that the whole population starts to benefit. It also makes your children happy. Why isn't every country doing this already ? Update: The end of free parking in Assen! The end of free parking ? So soon after I'd written about it ? Read on. Note also that this refers to just one free parking area near the city centre. Others will remain free of charge. It's an interesting story. A modification of the current policy. I'm not the only person to have noticed that car parks in Assen, whether paid or free, are mostly empty. The council has realised this too. 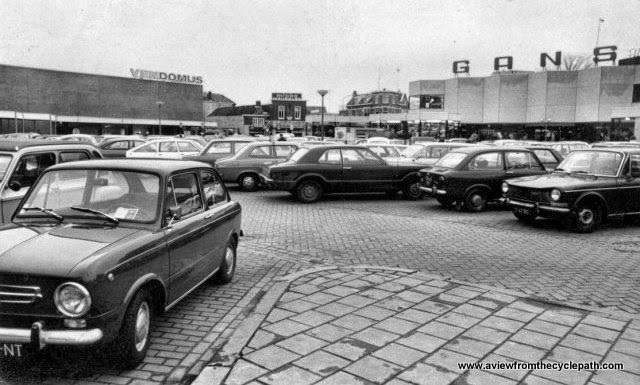 Car parking is supposed to be revenue neutral but because car parks "are largely empty and economically unsustainable", the city has had to subsidize car parking in Assen. Instead of subsidizing the car parks, the city wants to make them pay. In an attempt to attract drivers into the largely empty high-rise car parks, the city actually intends to decrease the cost of using these car parks. The all-day rate in Assen's high-rise car parks is to be halved from the current €12 to just €6 a day. At the same time, the city will increase the cost of on-street parking and remove free parking close to the city centre in order to give drivers fewer options and force higher use of the high-rise car parks. It's not a punitive move - it's merely a way of trying to make provision of parking in Assen become revenue neutral. Next to most cities, this is very much a luxury problem. It is a sign of a successful cycling policy that the car parks are not all already full. Rather than not being able to provide enough spaces to keep up with car parking need, Assen's population's use of bicycles has led to there being an over-supply of car-parking spaces and not enough cars to fill them. The result of charging just €5 per day for the previously free car-park at Veemarkt just outside the centre of Assen is that almost no-one uses it any more. Hence the picture of an empty parking lot in the newspaper. People prefer to pay €6 per day to park nearer the centre. Also as a result of this, the same local newspaper carried a full page advertisement on the back cover from the supermarket at that location offering free parking to anyone who spends €25. An unfortunate side-effect of encouraging drivers to use car parks which are closer to the centre of the city is that roads nearer the centre now have more cars on them. This has resulted in more problems for cyclists using the inadequate infrastructure at the cultural centre and the Kerkplein. Read an update about problems which resulted from the extra traffic. In answer to the question posed at the top, does free car parking making people drive cars ? No. It clearly does not. But making cycling unpleasant certainly stops them from cycling, and that is when people can feel they have no choice but to drive. Where cycling is made truly attractive, people no longer have to drive and car parks can become difficult to run on an economic basis.